Well the Laundry Room Make-over is coming along nicely, just a couple small projects left to go. 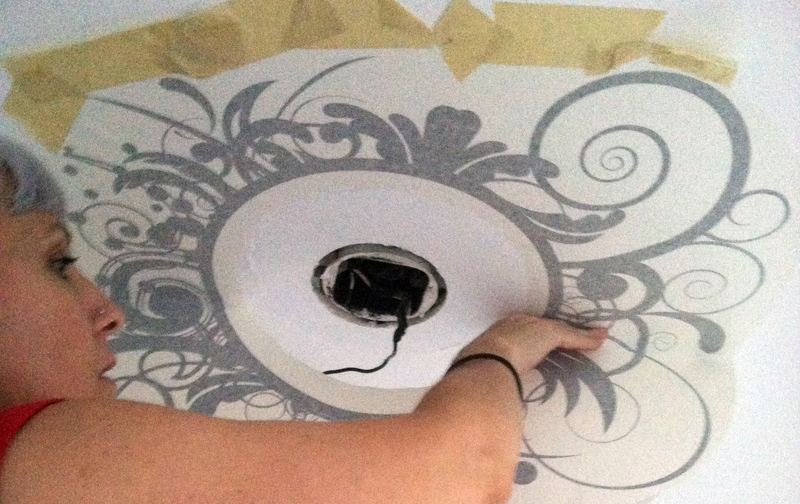 Over the weekend I finished up the ceiling with a “new” (well, new to me anyway) light fixture and custom graphic, and I love it! 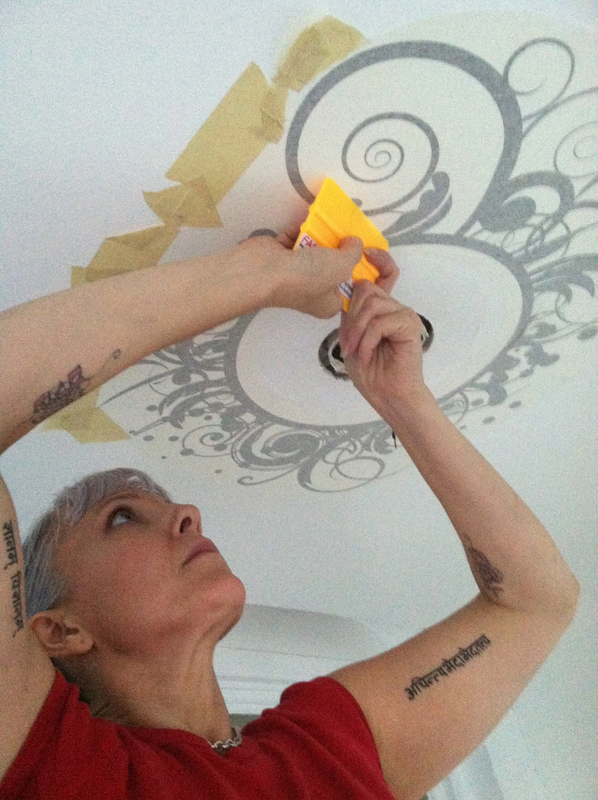 I knew I wanted to do something fun and graphic on the ceiling around the light, and thought about all the great new adhesive wall designs out there. I looked at whatisblik.com, dezignwithaz.com, Amazon, Target, and a host of others, but didn’t find something I liked. Then it hit me. Customize! I turned to RTA and it hit the spot. What is RTA? 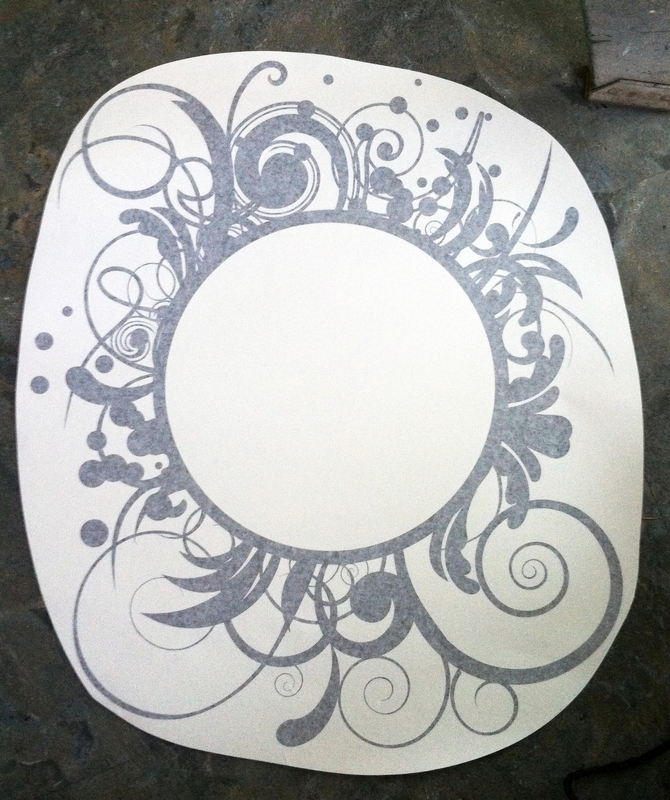 RTA stands for “Ready to Apply”, and is a rub-on vinyl product usually used for lettering, but also for graphics. I had used it in the past at art galleries to put show names and artist’s names on the wall for an exhibit, so I knew it would work great. It is easy to apply, and removable (hello renters!). Still, I had to find the right graphic, so I turned to my old standby for images, istock.com, and found just what I wanted. At istock, you purchase the image as well as the legal rights to use it. They have a fantastic selection. So I purchased my image, and chose Fastsigns to print it for me (competitive pricing and close by). I was able to easily email them the design, and they had it ready to go in a few days for $35. 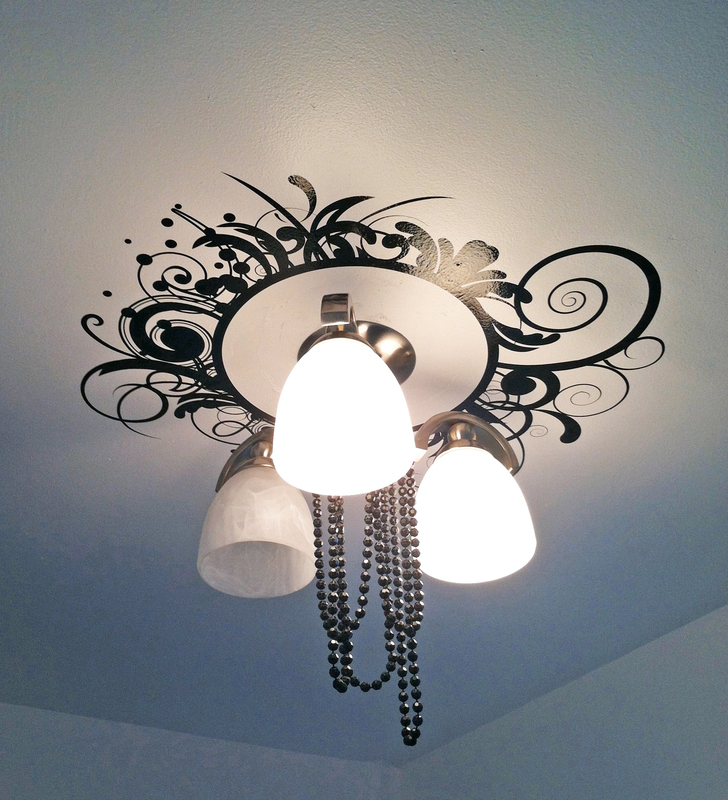 The light fixture came from my favorite Goodwill (surprise surprise) for $12, and I’ve had the vintage black beaded necklace for years. It has seen better days. I don’t wear it much anymore, so I decided to “retire” it into decorative use. 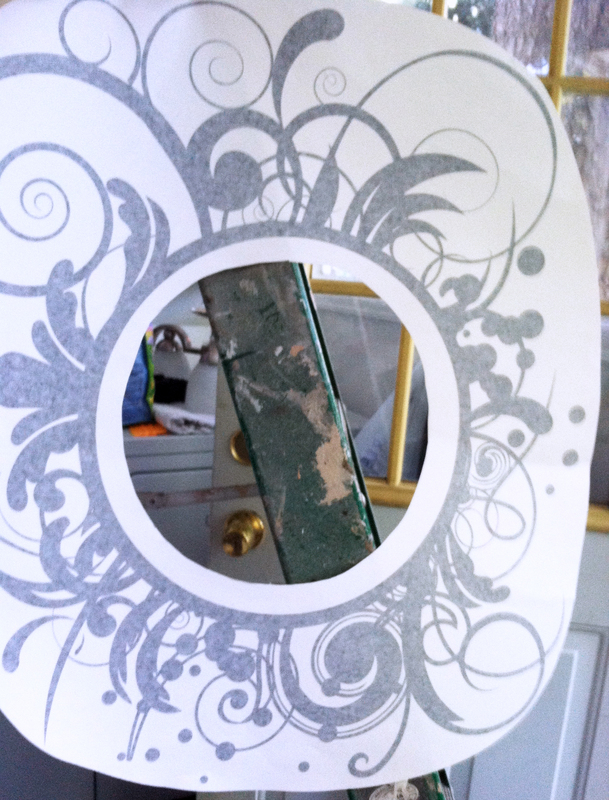 It is basically 3 layers: 1 layer of backing and 1 layer of adhesive with the vinyl design in between. 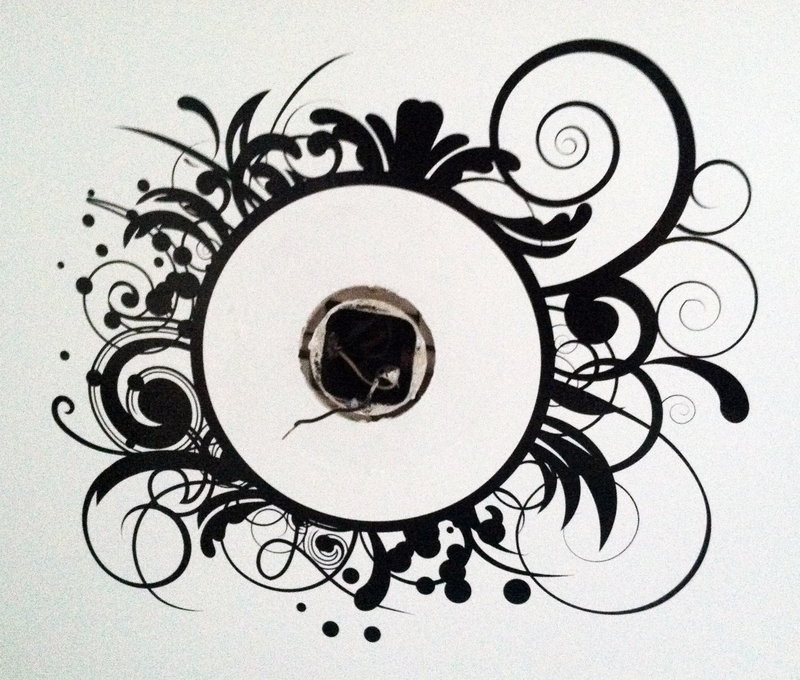 I cut out the center with an exacto knife to fit over the light outlet. 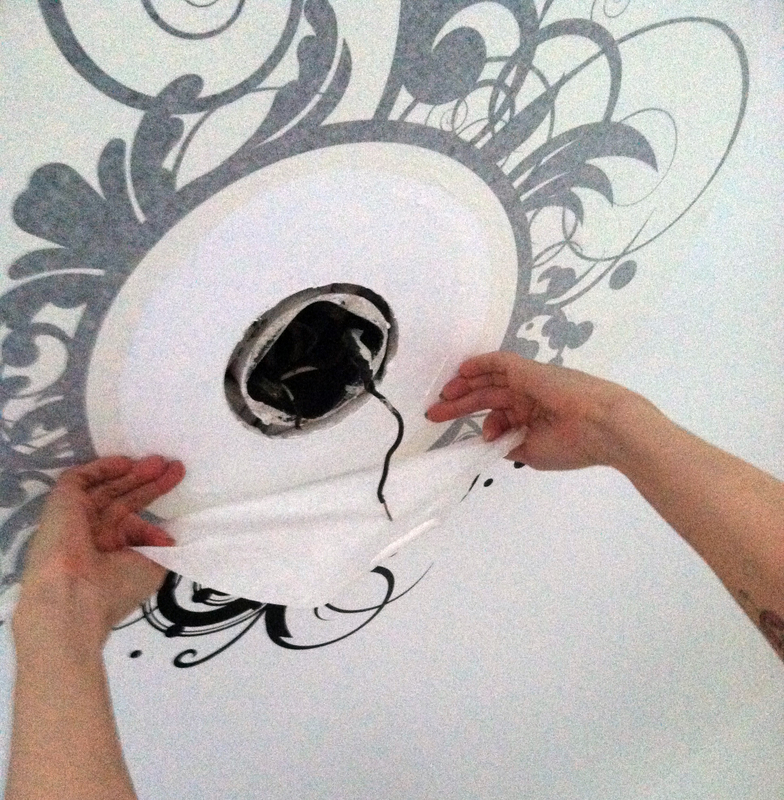 The next part was a little tricky, centering it over the hole. 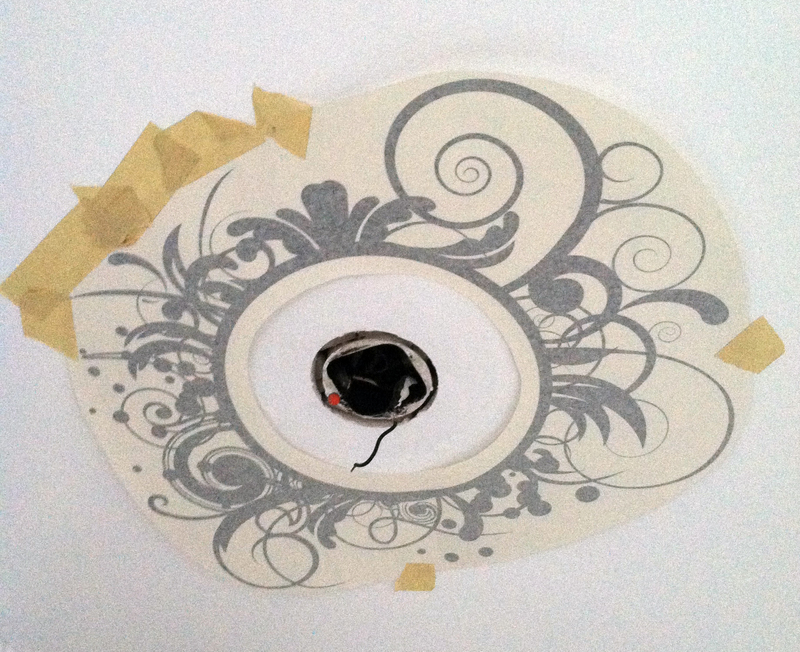 Once I had it where I wanted it, I used masking tape to firmly attach it to the ceiling, forming a sort-of tape “hinge” on the straightest side to hold it in place when I start to peel off the backing layer. Starting at the hinge side begin peeling off the backing slowly while pressing down (or since it’s on the ceiling, “up”) the sticky layer. Slow and smooth is the key, you don’t want any air bubbles or wrinkles. That’s it! The whole process took less than 20 minutes, and it looks great! I love knowing that no one else has a ceiling design like mine 😉 There are endless possibilities for RTA. Come up with your own design, your own words and styled lettering, anything you can imagine! 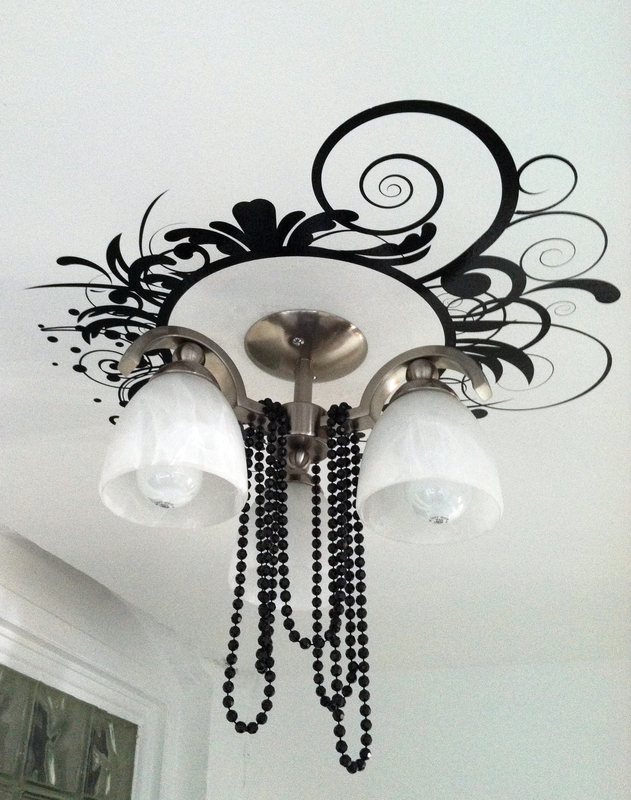 This entry was posted in decorating, DIY, home and tagged adhesive design, adhesive graphics, bargain hunting, budget, ceiling design, ceiling fixture, ceiling graphic, ceiling light, decor, decorating, design decor, DIY, fastsigns, Goodwill, installing RTA, istock, redecorating, redo, restyle, RTA, RTA graphics, saving, style, thrift store. Bookmark the permalink. ← The BEST Cup of Coffee Ever…and YOU Made it! Here’s how. Plus WIN FREE COFFEE FOR A YEAR From Pablo’s Coffee!